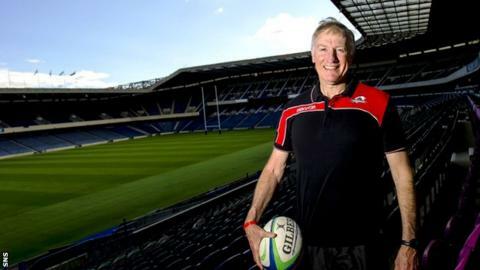 Edinburgh head coach Alan Solomons is targeting a top-six finish in the Pro12 with his new-look side. South African Solomons says his squad, who open with an away tie at Munster on Friday, is in a far better position than at the same time last year. "This season is about making Europe, about the top six," said 64-year-old Solomons, who took over in 2013. "The winds of change have been blowing and that's part of the building process. It's great to see." Ross Ford will captain the capital side in Munster with newly appointed leader Mike Coman starting on the bench. And, having arrived at Edinburgh too late to oversee a proper pre-season last term, Solomons is delighted to have been able to work with his charges before this campaign. "The Pro12 has moved into the same league as the Premiership and the [French] Top 14 - it's that stiff a competition," he told BBC Scotland. "It's been a long pre-season and everybody is looking forward to getting into competition. "We're in a lot better place than we were last year. We've got greater strength in depth, which is very important for a competition of this nature. We've been with the boys from the beginning and I'm happy with the conditioning that's taken place. "The foundation has been laid - it's now time for us to do the building. "If we look at last season, we had to have a pre-season in-season. I wasn't satisfied throughout the season with our conditioning and it told towards the end." But Solomons admits it may take time to hit top form. "What it's about is to start out getting our performance right," he said. "Sides that have been together for a long period will have no problem; sides that haven't will be a little bit undercooked at the start of the season. "I know we're a little bit undercooked but that doesn't concern me. It's important we go out and give a good performance against Munster and that's what we will be focusing on." Hamish Watson starts for Edinburgh in the open-side berth against Munster and Sean Kennedy fills the scrum-half spot.